Finding images that relate to the word “Gift” was my assignment recently, and it was harder than I thought it would be. I have been through the slump, the waning interest in my One Little Word, but now it has been revived. And the images I have selected, shown in this collage, bring new thoughts, new insights. The clock represents the gift of time, something I am more acutely aware of at this point in life, how I use it. The Christmas gift, with all the gold wrap and shiny images makes me aware that material gifts are nice but not the most important thing. The next little package is what I created to make me think of my OLW for 2011, and in B&W it is still lovely. Not flashy, just simple. 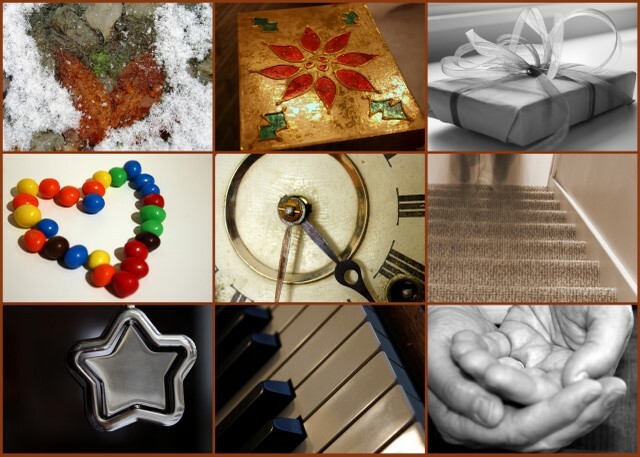 A simple gift…. The star keychain was a token of thanks that I received. This reminds me that expressing thanks is vital to life and I need to practice this more frequently. The image of the stairway with a ghost like figure on it – this represents the gift of dreams. Dreams are a true gift from God. Paying attention to them, learning the language/symbolism of those dreams helps me grow. The piano keys are all about talents and abilities, not just playing the piano. I have been blessed with many talents. How I share them or not share them affects me and those around me. The heart shaped leaf in water reminds me of love. Love found in unlikely places and circumstances. Love within me that I must share. The M & Ms are in the shape of a heart, too, but the message here is playfulness. Maybe it is also about photography. Still thinking about that one. The open hands remind me that I must be receptive to this word, gift, and to all that it brings into my life, that my hands and heart must be open to whatever comes. Thanks for the gift of your friendship, for stopping by and sharing my journey! what a very interesting word: gift. i will have to dwell on that one now. your photos are a wonderful capture! thanks for stopping by…and i am glad i did too! oh,gift is such a cool word. Love the photos selected!! M&M's in the shape of a heart – neat. And thanks for visting my blog. Thanks for leaving me such a sweet comment! Greats pictures. Gift is a great word, because it has so many interpretations.